"Keyboard for piano and guitar": 1 folded leaf at end. Includes indexes. 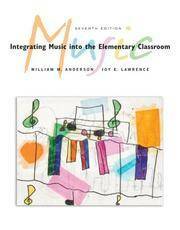 Anderson, William M.; Lawrence, Joy E.
Cengage Learning. SPIRAL-BOUND. 0495571873 New US Edition Textbook, Ships with Emailed Tracking from USA . New. Schirmer, 2009-01-29. 8. Spiral-bound. Used:Good. Cengage Learning. SPIRAL-BOUND. 0495571873 US Edition Textbook, May Have Highlights, Notes and/or Underlining, BOOK ONLY-NO ACCESS CODE, NO CD, Ships with Emailed Tracking from USA . Good. Wadsworth Pub Co, 1995-01-01. 3rd. Paperback. Used:Good. Thomson Schirmer, 2006-02-16. 7th. Spiral-bound. Used:Good. PAPERBACK. B007YTN3UE International edition. Has piano chart in back and access code still shrink wrapped. Presumably it will work but we cannot guarantee it. . Good. Thomson Schirmer. SPIRAL-BOUND. 0495064270 NEW BRAND NEW STILL IN SHRINK WRAP HAWAII AND ALASKA CUSTOMERS PLEASE USE PRIORITY SHIPPING SHIPS 2 BUS DAYS . New. Schirmer. SPIRAL-BOUND. 053451751X New Condition. . New. Schirmer. PLASTIC COMB. 0534528260 New Condition. . New. Schirmer. PAPERBACK. 0534237363 New Condition. . New. Schirmer. PAPERBACK. 0534525962 New Condition. . New. Cengage Learning. SPIRAL-BOUND. 0495569852 US Edition Textbook, May Have Highlights, Notes and/or Underlining, BOOK ONLY-NO ACCESS CODE, NO CD, Ships with Emailed Tracking from USA . Good. Thomson Schirmer. SPIRAL-BOUND. 0495064270 light shelf wear-May have slight imperfection(s). Ships fast!! . Fine. Schirmer, 2003-06-04. 6. Plastic Comb. Used:Good. Wadsworth Pub Co, 2000-08-01. 5th Bk&CD. Spiral-bound. Used:Good. Schirmer. PAPERBACK. 0534525962 Like New Condition. . Fine. Schirmer. PAPERBACK. 0534237363 Like New Condition. . Fine. Schirmer. SPIRAL-BOUND. 053451751X Like New Condition. . Fine. Schirmer. PLASTIC COMB. 0534528260 Like New Condition. . Fine. Wadsworth Pub Co. Used - Very Good. Ships from the UK. Former Library book. Great condition for a used book! Minimal wear. 100% Money Back Guarantee. Your purchase also supports literacy charities. Wadsworth Pub Co. Used - Good. Shows some signs of wear, and may have some markings on the inside. Thomson Schirmer, 2006-02-16. Spiral-bound. Good. Wadsworth Pub Co, 1995-01-01. Paperback. Good. Schirmer, 2003-06-04. Plastic Comb. Good. Wadsworth Publishing Co Inc, 2003. Paperback. Acceptable. Disclaimer:A readable copy. All pages are intact, and the cover is intact. Pages can include considerable notes-in pen or highlighter-but the notes cannot obscure the text. Schirmer. Used - Good. Shows some signs of wear, and may have some markings on the inside. Thomson Schirmer, February 2006. Paperback. Good - Cash. General use wear, surface and edges rubbed with some creasing. Corners bumped and show wear. Pages show reader wear. Unmarked pages. Secure pages, solid binding. Cover has creases. CD never used. Spiral Bound. Stock photos may not look exactly like the book. Schirmer, 2000. Book. Very Good. Soft cover. 5th or later Edition. Schirmer, 1997-12-23. Paperback. Very Good. Wadsworth Pub Co, 1995-01. Paperback. Good. Wadsworth Publishing Company, 2000-08-01. Spiral-bound. Good. Cengage Learning. SPIRAL-BOUND. 0495569852 Item in good condition. Textbooks may not include supplemental items i.e. CDs, access codes etc... . Good. Schirmer. PAPERBACK. 0534237363 Very Good Condition. Has some wear. Five star seller - Buy with confidence! . Very Good. Wadsworth Publishing Company. Used - Good. Shows some signs of wear, and may have some markings on the inside. Schirmer. Used - Good. Ships from Reno, NV. Shows some signs of wear, and may have some markings on the inside. 100% Money Back Guarantee. Shipped to over one million happy customers. Your purchase benefits world literacy! Wadsworth Publishing Company. Used - Good. Ships from Reno, NV. Former Library book. Shows some signs of wear, and may have some markings on the inside. 100% Money Back Guarantee. Shipped to over one million happy customers. Your purchase benefits world literacy! Schirmer. PAPERBACK. 0534237363 Satisfaction Guaranteed. Please contact us with any inquiries. We ship daily. We only ship Internationally via FedEx with tracking which is why our shipping price might be higher than others. . Fair. Wadsworth, 1994. Paperback. Good. Disclaimer:A copy that has been read, but remains in clean condition. All pages are intact, and the cover is intact. The spine may show signs of wear. Pages can include limited notes and highlighting, and the copy can include previous owner inscriptions. At ThriftBooks, our motto is: Read More, Spend Less.Dust jacket quality is not guaranteed. Thomson Schirmer. SPIRAL-BOUND. 0495064270 Student Edition. No apparent missing pages. Light wrinkling from liquid damage. Heavy wear, fading, creasing, Curling or tears on the cover and spine. May have used stickers or residue. Fair binding may have a few loose or torn pages. Heavy writing, highlighting and marker. Supplemental materials are not guaranteed with used books. . Fair.